New MCAT scoring and GPAs required by US medical schools and Canadian medical schools are provided in this website. To guide you in your journey to medical school, this page will provide you with helpful information such as new MCAT test scores range (good, high and highest scores), scores percentiles, your chance of medical school admission, and advice on how to attain a high MCAT score. The MCAT (Medical College Admission Test) is a prerequisite for admission to nearly all the medical schools in North America. This is administered by the Association of American Medical Colleges (AAMC) in hundreds of testing centers in the United States, Canada and around the world. In 2015, over 64,000 premed applicants to American and Canadian medical schools submitted their MCAT test results. While the actual weight given to MCAT scores in the admissions process varies from school to school, often they are regarded in a similar manner to your premed GPA (i.e. your academic standing). The MCAT has four sections, namely; (1) Biological and Biochemical Foundations of Living Systems; (2) Chemical and Physical Foundations of Biological Systems; (3) Psychological, Social, and Biological Foundations of Behavior; and (4) Critical Analysis and Reasoning Skills. Each section is scored from a low of 118 to a high of 132 while the midpoint is 125. The total score results from a combination of the four sections' scores. Total score range is from 472 to 528, with a midpoint of 500. The MCAT score report that you will receive would reflect the scores' percentiles, confidence bands that show your true score range, and score profiles that reflect your strengths and weaknesses. For your guide on new MCAT scores, click here: MCAT Score Report. 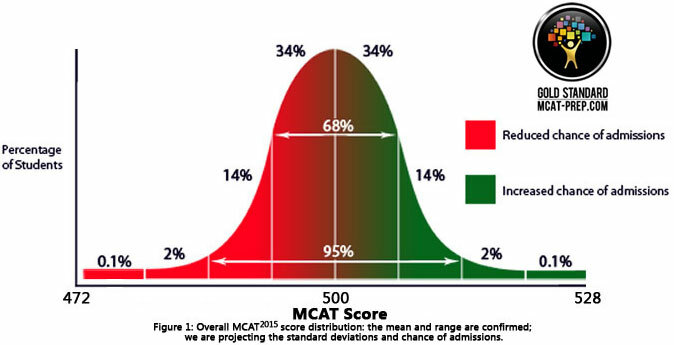 Note: 'Average MCAT score' refers to the average of students who were accepted to medical school. Apart from your MCAT score, your GPA and non-academic factors like your personal statement and/or autobiographical material, letters of reference, and the medical school interview influence your chance of getting accepted to medical school. MCAT scores that date back two or three years are accepted by most medical schools. Although the MCAT has changed in 2015, some medical schools will accept the old MCAT scores until the 2018 application cycle, while some require the new MCAT score for the 2017 application cycle. For a list of medical schools and their acceptance policy, click here: MCAT exam policy. What Are the Best MCAT Prep Materials? 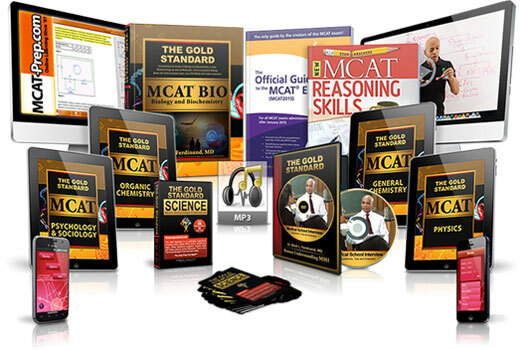 A complete multimedia home study package for the new MCAT: Books (The Official MCAT Guide by the AAMC, Examkrackers MCAT Reasoning Skills, and the new Gold Standard MCAT BIO book); high yield e-books (Psychology, Sociology, Physics, General and Organic Chemistry), apps, science summary MP3s, MCAT CARS program with 5+ tests, 5 full-length MCAT practice tests and access to our 30+ hours science videos.